Beginning in third grade and continuing into fourth, students at Ivy League are asked to bring to bear all of the basic skills learned in previous grades and apply them to learning in greater depth and breadth. These are the years of “automaticity” – when students recall of basic number facts, reading skills, and lower order thinking skills become fast, routine, and spontaneous. As automatic performance of low level tasks becomes internalized, it enables students to engage in more interesting aspects of learning – complex content and rich tasks which usually require higher order thinking skills. At this stage of development, students gradually move from being concrete in their understanding, to being able to handle more abstract and subtle ideas. Third graders are willing to tackle the new and the difficult with high energy. They are more concerned with “why” questions and willing to use a variety of resources to gather and organize information to produce an end result. In our third grade students begin to formally learn study skills. In third grade, Ivy League students read more widely and deeply and for many purposes. A variety of text types both fiction and non-fiction are used in guided reading lessons to increase students’ comprehension fluency and higher order thinking skills. Students are learning that different strategies and skills are required to understand increasingly difficult narrative and expository texts. In addition to comprehension skills developed in previous years, students will become more familiar with literary elements, compare texts, and summarize text passages that demonstrate inferential thinking with more challenging texts. They will develop more advanced phonic skills recognizing multi-syllable words and apply knowledge of letter-sound relationships to spelling and decoding unfamiliar words. Of particular emphasis in the third grade is the ability to “learn how to learn” from reading informational text with denser grammar, longer sentences, unfamiliar words and complex ideas. Through using their science and social studies texts, as well as informational texts and the internet, students are taught how to use all the structures and conventions of non-fiction to assist with understanding. Reading and writing become more closely intertwined as students at Ivy League become familiar with what good writers do to tell a story or share information. In our third grade, teachers continue to raise the quality of writing through Writer’s Workshop and by continuing the use of the 6+1 Traits of Writing Framework, which breaks down the otherwise complex process of teaching writing into manageable chunks (i.e. ideas, organization, word choice, conventions, sentence fluency and presentation). Students are challenged to expand their ideas in the revision process, not simply to correct. They begin to understand that learning to write well is cumulative and the revision process is a way to use their repertoire of strategies as a tool box to improve their work. They learn to elaborate by adding more detail. They become more adept at proofreading their own writing as well as that of others. They can utilize an editing check list, and with some assistance during writer’s workshop, revise original drafts to improve sequence, or add voice to personal narratives. Ivy League students in third grade are acquiring an understanding of the mathematical processes which include problem solving, reasoning, communication, connections, and representations. These processes are made more explicit throughout lessons. Five of the math strands: Numbers and Operation, Algebra, Geometry, Measurement, Data Analysis and Probability are introduced with a brief review and followed by the introduction of new concepts. The sixth strand of the program, Problem Solving Strategies, is part of every component. SMART Board® technology developed specifically for this program, increases understanding of complex ideas by presenting them in visual form. Touch screen features give students opportunities to show how mathematical ideas can be expressed in many different ways. Learning to use problem solving strategies such as making tables or drawing, looking for patterns, using objects, writing a number sentence or working backwards, are integral to the twenty mathematical ideas explored in grade three. In third grade, students add to their number sense by increasing understanding of place value, to the ten thousands and beyond. They learn to factor numbers and how to express them in arrays. The difficult principle that division is repeated subtraction and is the inverse of multiplication is introduced. They learn more about solids and shapes, congruence and symmetry, perimeter and volume. Real world examples are used to stimulate students’ interest. For example, they are asked to solve geometric problems using the Statue of Liberty, the Empire State Building, or a Ferris wheel as points of reference. Perhaps the most challenging concepts for third graders to grapple with are the relationship between decimals, fractions and money values. These skills are introduced in our third grade and reviewed in subsequent grades. In the third grade, students undertake the study of their own communities, communities of long ago and communities around the world. Our students study Western and non-Western countries which reflect the diversity of the world’s people, geography, history and culture. In keeping with world language studies, the class as a whole investigates China and Central America and compares these regions to our own way of life. In the third grade, students integrate cognitive and creative processes by applying skills they are learning with information they are gathering to produce a finished product. Using what has been modeled in their earlier studies of community, each student chooses a country to study with the outcome being a travel brochure, poster or travelogue to express what they have learned and to entice tourists. In this process, the teacher acts as a facilitator and guide, helping our students reduce the task into manageable chunks. Students learn how to collect and organize notes on index cards, use graphic organizers and resource book features such as the index and construct a simple bibliography. They choose photos, create maps and drawings and use elements of design to create a finished product. Ivy League third graders are taught to set timelines and evaluate their progress according to a pre-set rubric. Audience sharing with other classes and parents provides an authentic means for using speaking skills, learning to answer questions and listening for feedback. 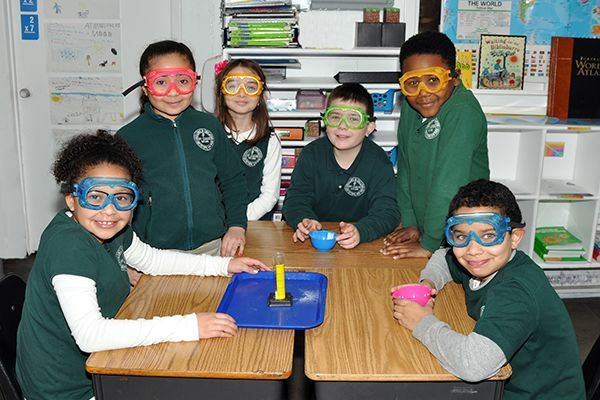 The goal of third grade science is to expose students to important ideas in our immediate physical setting and living environment. Lessons focus on basic needs, characteristics, life cycles and adaptations of plants and animals which allow them to live and reproduce. The Ivy League campus becomes a living laboratory as students stake out a four by four plot and monitor the living things within it day by day. Utilizing scientific techniques, they observe and record how living things in their own environment interact and survive. Critical to understanding science concepts is scientific inquiry to develop explanations of natural phenomena. For instance, in class, students plant and grow bean plants in a variety of conditions to learn firsthand about plants’ needs and how they respond to different environmental factors. To best understand eco-systems, students research and build and care for a terrarium. This habitat also serves to demonstrate the water cycle. Within this life science unit, students learn to classify and identify the characteristics of the five animal groups as they relate to physical characteristics, habitat, skin covering, and camouflage. Additional third grade lesson modules focus on the Earth’s surface and its relationship to the sun and moon. Lessons focus on characteristics of the Sun as a star and how its light and energy affects the water cycle, wind, weather and photosynthesis. Ivy League students compare changes which occur over time such as weathering, erosion, and sudden natural disasters. They learn how scientists use tools to forecast weather, predict Earth’s changes and communicate data to the public. Our dedicated science teacher introduces our third graders to the physical properties and behaviors of matter and how important these properties become when scientists design new projects.